1 Gucci. 2 Alice + Olivia. 3 Diane Von Furstenberg. 4 Rebecca Minkoff. 5 Romwe. 6 JCrew. 7 Roksanda Ilincic. 8 Asos. 9 Moschino. 10 Mysuelly. 11 Dsquared2. 12 Victoria, Victoria Beckham. 13 B Brian Atwood. 15 Just Fab. 16 Lipsy. My trend reports stick to current season runway shows however I have began this article with Gucci's SS 2011 campaign. I did this because for me that's where my love for colour blocking all began. Each look was so striking and I can bet every girl that loved this trend at that moment wanted to get their hands on that gold belt that tied each of their looks together! Gucci's colour block look was replicated by handfuls of celebrities and the great part for us is we all can achieve this trend with what works for our budget. Now we are in SS 2012 and the trend has still stuck around. 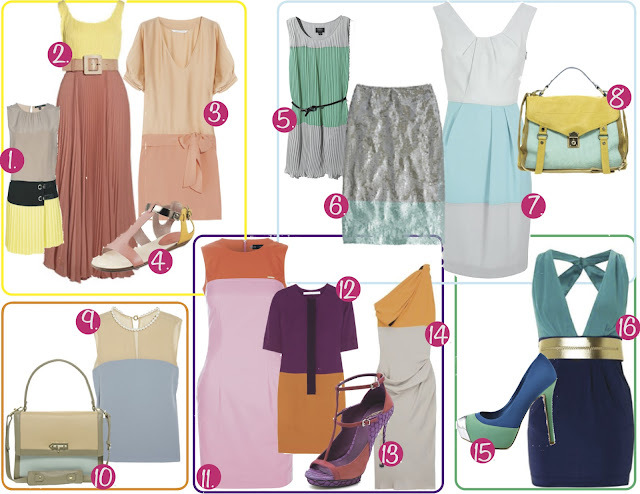 What's cool about it now is we see colour blocking done using bright colours and pastels. Some trends come and go and others like this one adapt to incorporate new trends. So how do I recommend wearing this trend? Colour blocking is meant to be fun. To start off easy stick to colours in the same family like pairing red with fuchsia or turquoise with cobalt blue. However if you are a bit more adventurous and have a keen eye on great complementing colours not within the same family go for it! One of my favourite looks above is a great example of this. In Ani's outfit she has paired a royal blue with yellow and it looks beyond amazing!!! So play with alike colours and get daring by placing together colours you wouldn't normally and trust your judgement on if it works well or not. When it comes to accessories I'm torn. Sticking to neutrals or metallics are safe since your outfit is already very loud however with some colour combinations adding even more colour works! If you are going all out keep the jewellery again in the same family or ensure it's a complementing colour to your look. Use the bloggers above to help guide you. I've made sure to include different colour combinations and some more safely put together than others. I agree...those first colorblock looks with the wide metallic gold belts set the trend on fire! Great inspirational roundup! Color blocking is an exciting fashion trend! so so pretty! i love colorblocking~ xO!xO! Estos colores de temporada me encantan! Son los mejores, Guapa ya te sigo, Sigueme! Colour blocking can look so so amazing! These are all fantastic examples! Love all the pics! Thank's for sharing! Great inspiration! Followed you back dear! Would you like to follow via bloglovin as well? awesome photos. i love the colorblocking! it´s so cool i´ll be back soon! 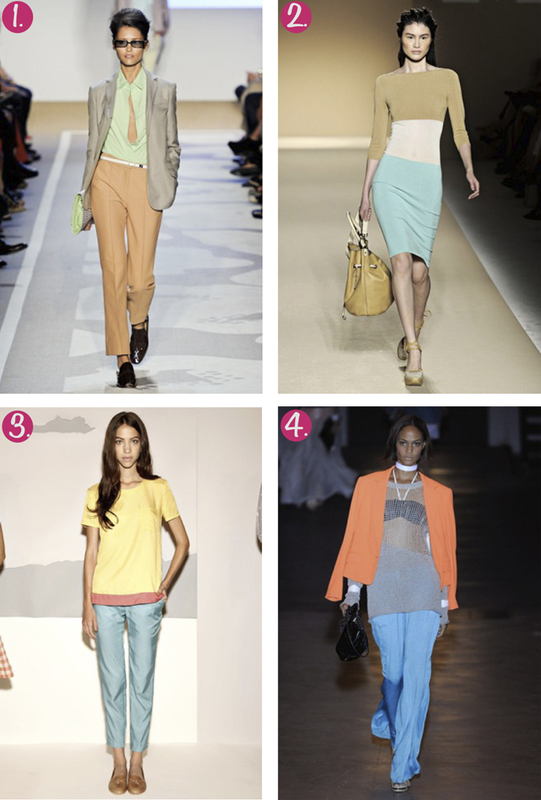 i love color block <3 this trend is soo fun and chic! Your blog has been accepted in NORTH AMERICA CANADA a minute!